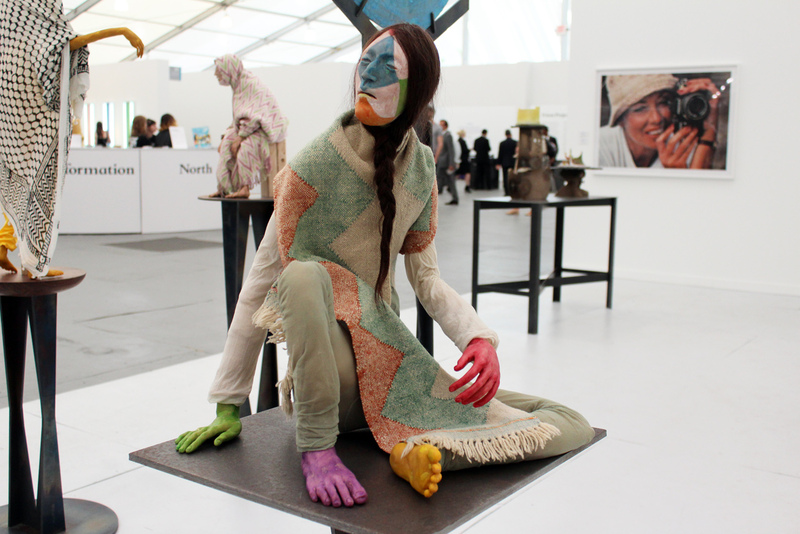 NEW YORK—For its second year, the London-based Frieze Art Fair has descended on New York, turning sleepy Randall’s Island into a temporary art mecca. This year, shuttle bus service is available in front of the Guggenheim Museum and fair goers are transported through Harlem to the remote venue (last year the shuttle stop was in Harlem), where an outdoor sculpture park anchored by an enormous red ballon dog by Tom McCarthy (not Jeff Koons) greets visitors upon arrival. The crowds have been healthy. 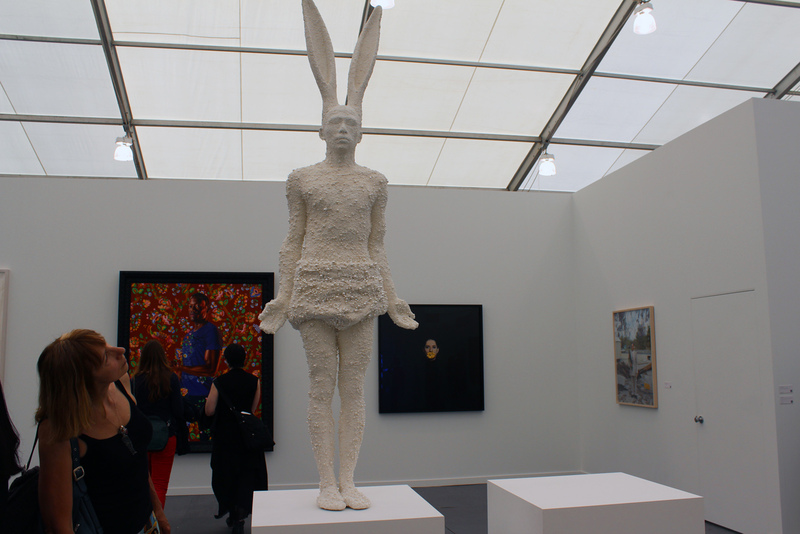 Inside a white tent that is the equivalent of several city blocks long, more than 180 galleries from around the world are exhibiting weird and wonderful contemporary art. A program of talks, sound projects, and opportunities for school and museum groups is offered, and and there is an education space for families with children. If you get hungry, the kale Caesar salad offered by The Fat Radish is delicious. 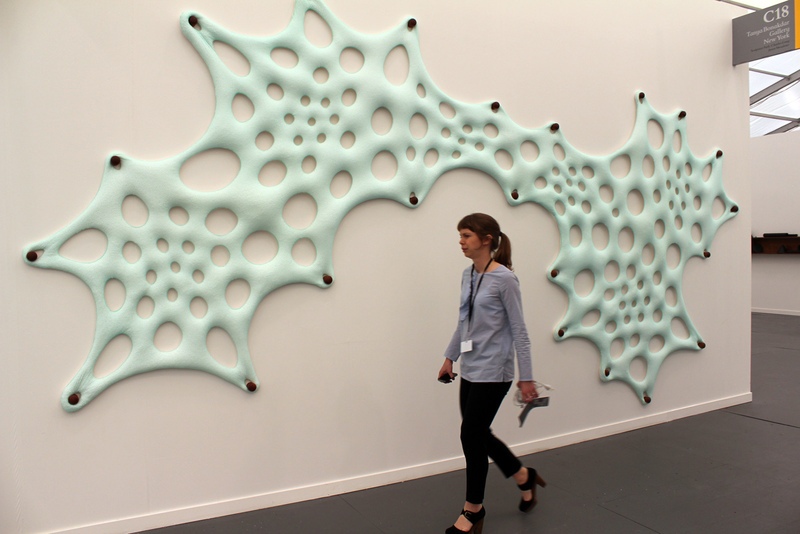 Frieze New York is open through Monday, from May 10 to 13, 2013. Tickets for the fair and transportation to Randall’s Island must be purchased in advance (if you arrive ticketless, there are a few terminals on site where you can purchase tickets, or you could do so on your smart device). For a fee, in addition to the shuttle, there is a ferry service and if you want to drive, limited parking is available. 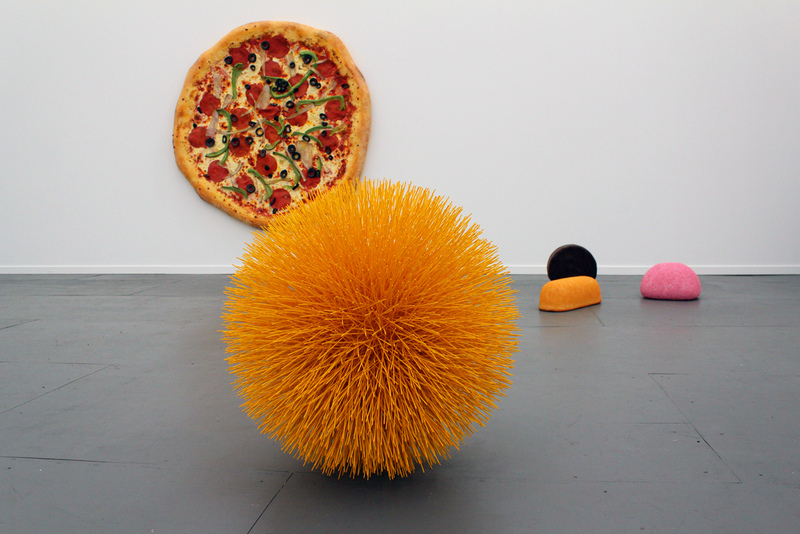 From left, “Untitled (pizza),” 2013 (styrofoam and paint); “Untitled (Hostess treats),” 2013 (styrofoam and paint); and “Untitled (sun,)” 2012 (wood, styrofoam and paint), all by Tom Friedman at Luhring Augustine of New York. 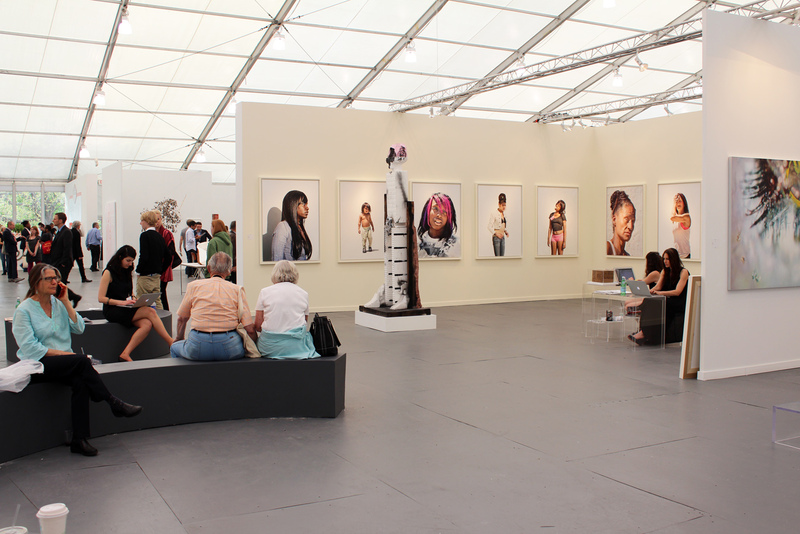 View from the fair floor of the Salon 94 booth, featuring archival prints of anonymous people in Bakersfield, Calif., by Katy Grannan. 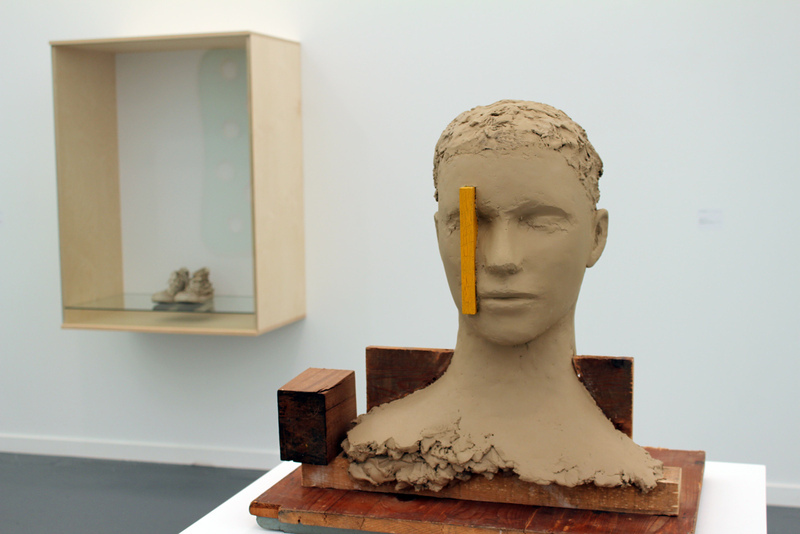 “Head with Yellow Vertical,” 2010-11 (wood, painted epoxy, painted wood, iron) by Mark Manders at Tonya Bonakdar Gallery of New York. 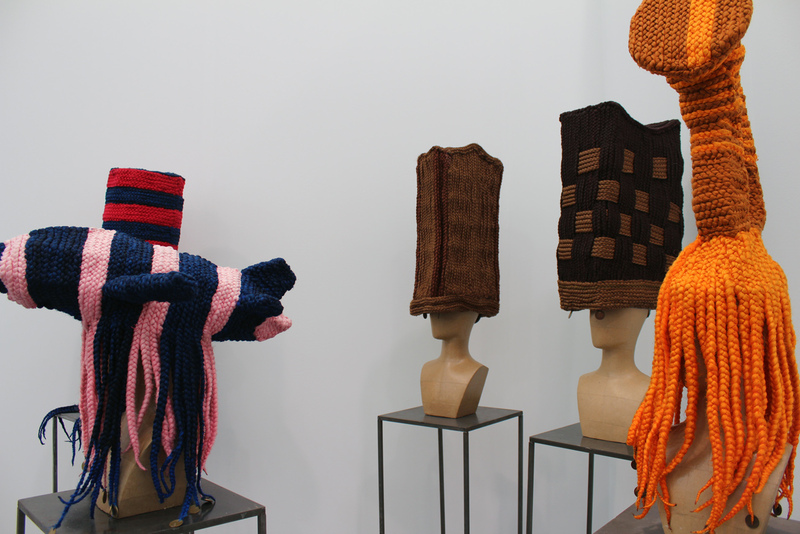 From left, (obscured) “Abraham Lincoln,” 2010-11; “Le rreres Wright,” 2010-11; “Milan (perruque architecture),” 2006; “Milan 2 (perruque architecture)”; and “Fela Kuti,” 2010-11 (all braided artificial hair and mixed media) by Meschac Gaba at In Situ/Fabienne LeClerc of Paris. 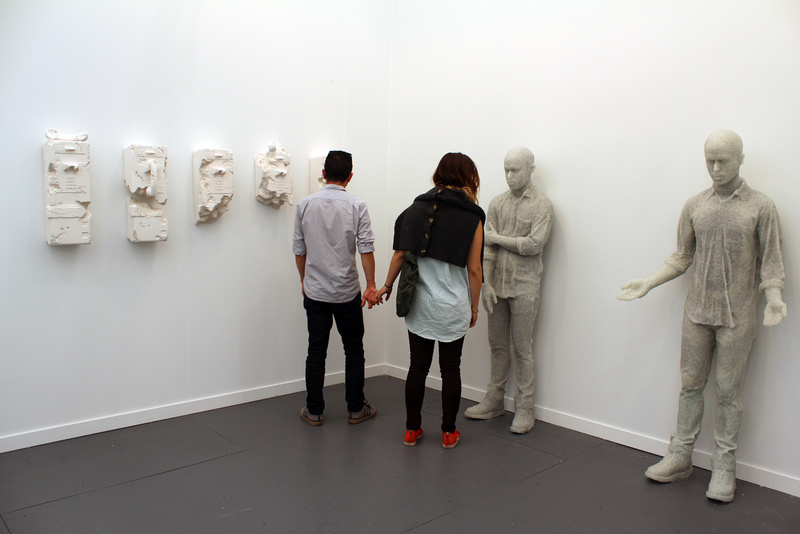 From left, “Eroded Payphones,” 2013 (crystal, shattered glass, hydrostone); with “Open Hands” and “Waiting,” both 2013 (broken glass, resin), all three by Daniel Arsham at Galerie Perrotin of Paris and Hong Kong. Detail of “Upset,” 2011 (modeling material, foil, wire, paint and cloth) by Francis Upritchard at Anton Kern Gallery of New York. 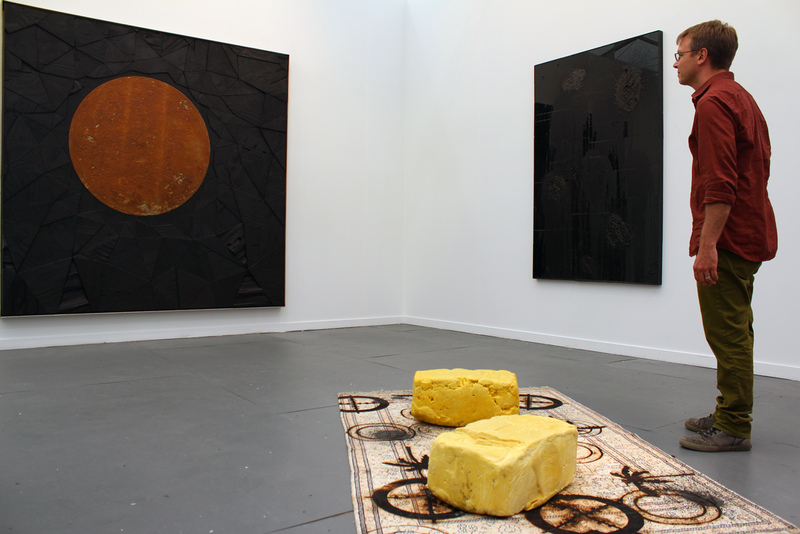 In foreground, “Untitled Branded Shea Butter Rug,” 2013 (branded Persian rug, black soap, wax, shea butter), at right “Pain in My Heart,” 2013 (black mirrored tile, black soap, wax) both by Rashid Johnson, with work by Matthew Day Jackson at left, at Hauser & Wirth of New York. 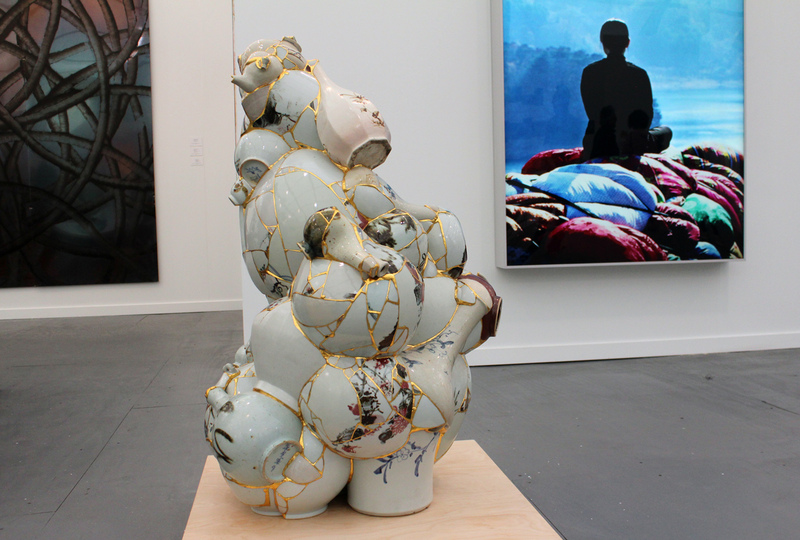 “Translated Vase,” 2012 (ceramic shards, epoxy, 24K gold leaf) by Sookyung Yee at Kukje Gallery of Seoul/Tina Kim Gallery of New York. 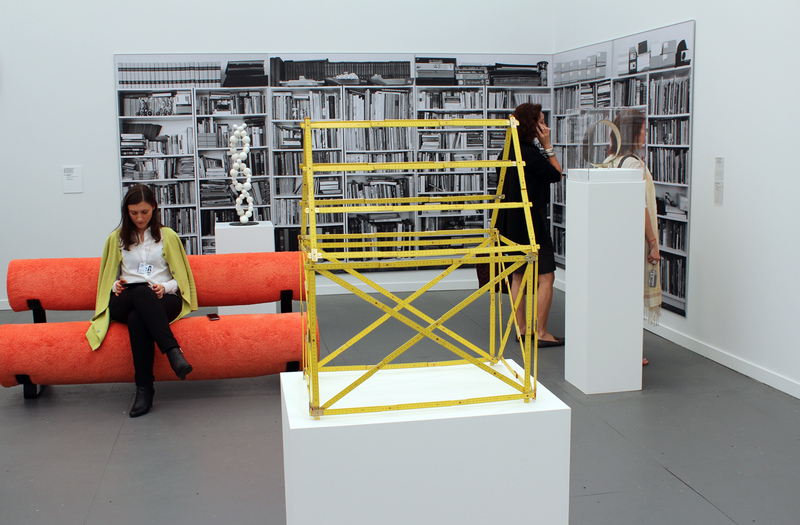 “Yardstick House,” (wood, metal) by Hans-Peter Feldmann, with “Untitled,” 2011-12 (steel structure, two cylinders of carpet)by Mathieu Mercier, and in the background “Bookshelves (Billy by Ikea),” (lambda print on aludibond, in five parts) by Hans-Peter Feldmann at Mehdi Chouakri gallery of Berlin. “Boy by the sea,” 2008 (mixed media including basswood, fish scales, faux pearls, pinewood block, wood stain, white powder pigments, white acrylic paint, white muslin cloth) by Terrence Koh at Sean Kelly of New York. 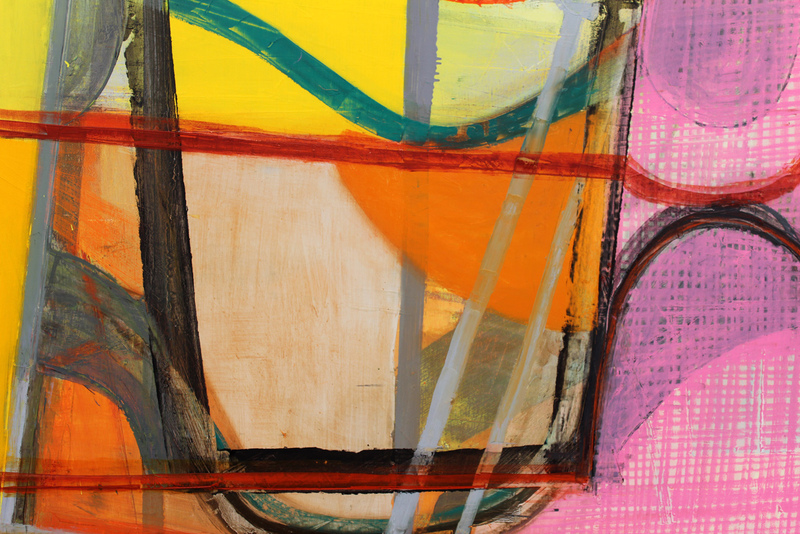 Detail of “Untitled (pink grid),” 2013 (oil on canvas) by Amy Sillman at Sikkema Jenkins of New York. “Splasmiopylea,” 2003 (polyamide textile, styrofoam beads, wooden pegs) by Ernesto Neto at Tonya Bonakdar Gallery of New York.